BOISE, Idaho -- David Lunsford is an avid gun owner with a firing range on his Texas spread. With bump stocks about to be banned by the U.S. government, he grudgingly decided to sell off his and let someone else figure out what to do with them. “If I get caught with one, I'm a felon, and it seems like to me that's entrapment in the biggest way. I bought that thing legally with my hard-earned money,” said the 60-year-old Lunsford, who has at one time owned six AR-15 rifles that he built from kits, as well as a World War II German submachine gun. The bump stock - the attachment used by the killer during the 2017 Las Vegas massacre to make his weapons fire rapidly like machine-guns - will become illegal on Tuesday in the only major gun restriction imposed by the federal government in the past few years, a period that has seen massacres in places like Las Vegas; Thousand Oaks, California; Sutherland Springs, Texas; and Orlando and Parkland, Florida. Unlike with the decade-long assault weapons ban, the government isn't allowing existing owners to keep their bump stocks. They must be destroyed or turned over to authorities. And the government isn't offering any compensation for the devices, which can cost hundreds of dollars. Violators can face up to 10 years in prison and thousands of dollars in fines. Lunsford bought three bump stocks over the years and wanted to recoup at least some of the money he shelled out, but it bothers him that he and others have been put in this position. “I've never committed a crime with it, and just because of that one killer up in Las Vegas that used one that killed a bunch of people, they're going to make people pay for it,” he said. The prohibition goes into effect less than two weeks after the mosque shootings in New Zealand that left 50 people dead. New Zealand's prime minister reacted swiftly to the bloodshed by announcing on Thursday a ban on military-style semi-automatic firearms and high-capacity magazines. 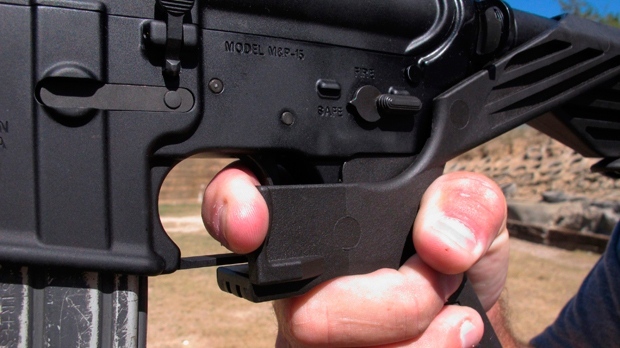 The U.S. Bureau of Alcohol, Tobacco, Firearms and Explosives first ruled that bump stocks were legal in 2010, and since then, the government estimates more than 500,000 have been sold. They were originally created to make it easier for people with disabilities to fire a gun. The device essentially replaces the gun's stock and pistol grip and causes the weapon to buck back and forth, repeatedly “bumping” the trigger against the shooter's finger. Technically, that means the finger is pulling the trigger with each round fired, a distinction that led the ATF to allow the devices. They were considered by most gun owners to be a novelty and weren't widely known until a gunman attached bump stocks to several of the AR-type rifles he used to rain bullets on concertgoers outside his high-rise Las Vegas hotel room. The attachments were swiftly condemned by even ardent gun supporters, including President Donald Trump, who directed the Justice Department to rewrite the regulations to ban them. The impending ban was announced in mid-December. Owners are being advised to either destroy them by crushing, melting or cutting them up or set up an appointment with the ATF to hand the devices over. A week before the ban was set to take effect, bump stocks were being sold on websites and by at least one company that took over the inventory of Slide Fire, the Texas manufacturer that was the leading maker and has since shut down. Ryan Liskey, of Virginia's Shenandoah Valley, said he isn't sure what to do with his bump stock. He said he got the device as a lark after trying it on the range with some friends. ATF spokeswoman April Langwell said “a number of people” have already turned in their devices to ATF offices across the U.S., but she wouldn't say how many. Starting next week, a person in possession of a bump stock can face federal charges of illegally possessing a machine-gun. “We're going to enforce the law and those in possession will be subject to prosecution,” Langwell said. The rule was met almost immediately with resistance from gun rights advocates. 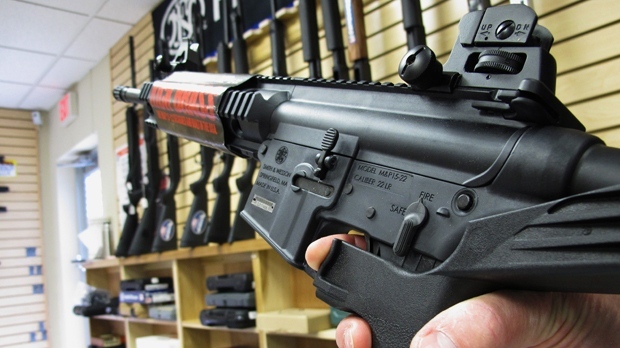 A federal judge in Utah refused to block it last week, and in February, a judge in Washington said the Trump administration can move forward with it, saying it was reasonable for the ATF to determine a bump stock performs the same function as a machine-gun. An appeals court is set to hear augments in the case on Friday. Gun Owners of America, a gun-rights group, is among those challenging the ban. GOA's executive director, Erich Pratt, said the measure is an abuse of power and an end run around Congress. Gun-rights advocates and gun-safety activists agree on one thing: The ban would have been seen as more acceptable had Congress tackled the issue and enacted a law, rather than relying on a federal agency to do it administratively.